Video recipe - If you want to make Danish pastries and desserts, there is simply no way around marzipan. I have many danes living away from the country asking for a marzipan recipe. Because you can not buy it in most places in the world. I have not been happy with the recipes I could find in the literature or online, so here is the one I have made. It took only 1½ weeks of experimentation and reading up to get it right:-S I also contacted one of the major danish marzipan manufacturers (Odense) that kindly shared some secret. Let the bitter almond soak in cold water overnight, about 12 hours. just let it rest at room temperature until you can deskin it with your nails, or you can easily peel the skin off with a small knife. Split it in two halves so that the water more easily can get to the larger surface, that provides. Let it soak for a further 12-24 hours at room temperature. Change the water every 8 to 12 hours. The longer it soaks, the more bitterness is soaked out. So the soaking time is a matter of taste. I let it stand for 12 hours. Put the water and the sugar in a saucepan. Stir and heat until the sugar has dissolved . It does not matter if there is a small amount of non-dissolved sugar left. It will sink to the bottom, and we will not need all the syrup, so remaining crystals are easily avoided. Let the syrup cool to lukewarm before it is mixed with the almond flour. Do not let the syrup cool for too long though, as it will crystallize after a while. If you have not replaced some of the plain sugar with dextrose or glucose that is. If it has crystallized it can still be saved by adding 1 teaspoon of water and bringing it back to a boil again. If you want to use the marzipan for baking, you can just make syrup of plain sugar, the heat and other ingredients in the baked goods will easily dissolve the sugar. If you want to eat it raw or use it for chocolate covered candy, it's a good idea to replace 1/4 cup (75 grams (20%-30%)) of the sugar with glucose or dextrose to avoid crunchy sugar crystals in the final marzipan. Bring a saucepan with plenty of water, eg ½ gallon (1 ½ liters) to a full boil. Add the almonds. Bring the pot to a full boil again. Turn it off and let the almonds soak in the pan for approx. 2 minutes. IMPORTANT! As soon as the almonds can be deskinned you must remove the hot water and cool them down. The longer the almonds are heated the more flavor they loose. After draining, put some cold water into the pan. Deskin the almonds as soon as they have cooled enough for you to hold them in your fingers without burning you. Put them on a towel to dry for about an hour. Turn them over once or twice if necessary. When the almonds are cool and dry on the surface, grind them in 4-5 batches in a blender or a coffee grinder. I use a coffee grinder. It is smaller and spins very fast, so it is better suited than a blender. Put the bitter almond into one of the regular almond portions and let it blend alongside, so that it is ground and mixed in at the same time. When all the almonds are ground, stir the flour together to ensure that the bitter almond is evenly distributed. Add about 4 tbsp (60 ml) syrup and knead it to a uniform sticky mass. How much syrup should be added depends on how much water the almonds have absorbed during the boil. The final marzipan should not be crumbly, but neither should it be very sticky. you should be able to roll it on a table with only a little marzipan getting stuck. It keeps for about 3 weeks in the refrigerator. In a danish "pure raw marzipan" the marzipan must consist of at least 60% almonds according to danish law. The rest is sugar and water. There are some recipes online with 50/50 sugar and almonds. But that is far too sweet for a danish marzipan. In California almonds (the most common and inexpensive sort), there is virtually no bitter and complex taste. So they are hard to make a really good marzipan of. Spanish Valencia almonds are slightly more bitter and contains more oil. So they behave and tastes differently. Therefore there should also be used less bitter almond. Try using ½ instead of 1. Organic almonds may contain some bitter almonds, but it is hard to know in advance exactly how bitter they are, or how many of them there are. So it is a little bit of a Russian roulette to use them for marzipan. Maybe it will be good maybe not. For my tests, I used the "boring" (and inexpensive) Californian almonds. The result was a good marzipan with the same quality as regular "Pure raw marzipan" from the main danish manufacturers like "Anthon Berg", "Odense Marcipan" and "Chef's Kitchen". Better almonds will result in a better taste, but California almonds are quite acceptable for a basic marzipan though. The almonds should not be over a year old (harvest date), they oxidize and develops a rancid taste. The packaging date may be a hint as to when they were picked, but there is usually no way to be sure. Unfortunately, it is usually difficult to get any information about the harvesting date. 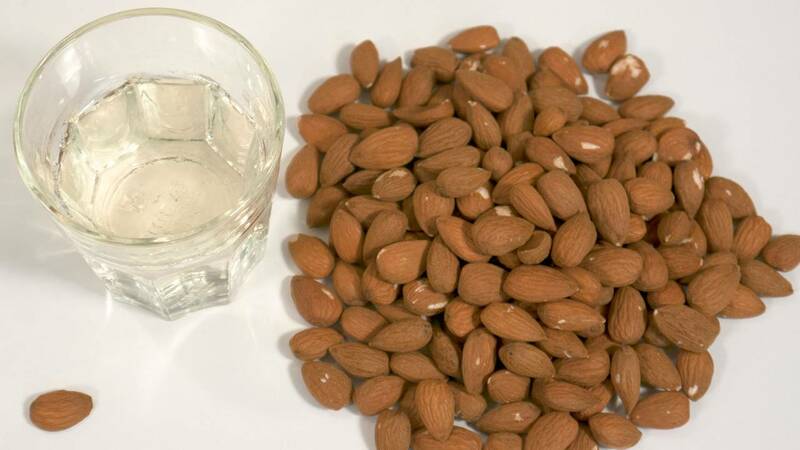 The bitter almonds must be deskinned and can be soaked from 12-36 hours in cold water to remove bitterness. It is not uncommon to put egg whites in marzipan. It is used in as diverse places as Norway and the United States. So it is not a wrong thing to do. But it is not used in Danish marzipan. Only when we bake cakes and pastries do we use egg whites as part of the recipe. Completely raw dried almonds with the skin on are so dry that they typically excrete oil when you blend/grind them. So you will not get marzipan, but a spread much like peanutbutter. 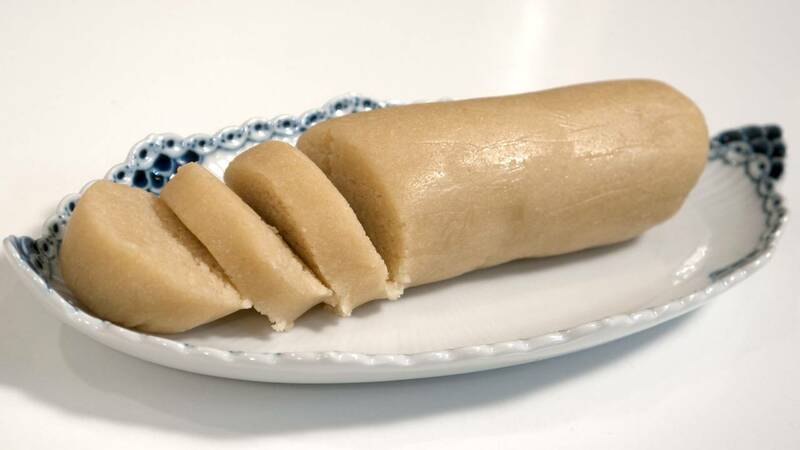 If you decide to leave the skin on for a whole grain marzipan, they should at least be soaked in the water for 12 hours so that they can be blended without the oil separating. In many recipes the almonds are first to be boiled so that they can be deskinned and then dried in an oven. This is not necessary. Actually it is a bad idea. The more the almonds are warmed up, the more of the dense and complex almond flavor disappears. So if you heat the almonds too much, you get a very weak and watery tasting marzipan flavor. So as little heat as possible is the secret to achieve a good taste. Almonds actually lose a lot of flavor and richness when they are heated. Therefore, they should not even be too long in the boiling water before they are deskinned. And don't just leave them in the hot water after boiling. If you do decide to dry them in the oven and they become too dry, that will also make the oil separate from the almonds, when they are processed into flour. As with the dried almonds. Therefore, baking is a bad idea. If heat them even more and roast the almonds slightly golden. Eg. 8-12 minutes at 360°F (180°C) convection, they taste of peanut butter instead of marzipan, and the resulting marzipan will be much darker. Slightly golden roasted almonds taste excellent in a salad with a little salt, but it is not good in a marzipan. Many recipes says that to 1 oz (300 grams) almonds needs 3-6 bitter almonds. That is far to much. The bitterness will overpower the regular almond taste. According to Odense marzipan, in 794 lbs (360 kg) finished marzipan they use 3 bitter almonds! They are used as they are though. They are not soaked to remove the bitterness, so they are far more bitter. Now it's hard to work with 1/8 of a bitter almond or less in a recipe, therefore I use 1 bitter almond, which in turn is "debittered" by letting it to soak in a bowl of water at room temperature. You should not boil the bitter almond with the other almonds for deskinning. it will have virtually no taste of bitter almond afterwards. It will be even worse if it is roasted in an oven as well. The taste is also changed by the heat, from being the well known strong full and complex almond taste, only to end up as a nasty bitter aftertaste in the final marzipan. Raw bitter almond taste like a much stronger and more bitter version of apple seeds. If you have ever tried to chew those. Rumor has it that you can use bitter apricot kernels instead of bitter almonds. But I have not tried that myself. Bitter Almonds can be purchased online and in specialty stores. You have to google it yourself to find a store in your area. I also tried to make marzipan with a maple syrup, but the marzipan gets very strongly flavored by it, so it ends up tasting like american pancakes with syrup. A nice taste, but not really marzipan. In the end I would like to send a big thank you to Odense Marcipan whom were very responsive to my questions. A store near me sells Almond flour - can I just use that instead of processing my own, or is there some sort of secret involved...? No secret here . Yes you can. The reason for whole almond is it's less costly. I live in Vancouver, Canada and have been unable to find whole bitter almonds. I have found bitter almond extract and wonder if I can use that in lieu of a bitter almond and if I can what amount should I use for the recipe. Because I cannot find the bitter almonds in Boston, I use the Dr. Oetker (or other German) bitter-mandel which is highly concentrated, available in very small vials at European specialty stores, and use only drops (depending on quantity). It makes a wonderful marzipan! Can you freeze the marzipan? From my own experience I can add that wrapping marzipan tightly (no air) in a plastic bag and putting it in the refrigerator will help keep it for months. I only use it occasionally, so it works for me. Hi. I just wanted to share the fact that almonds are by no means the only nut, that can make a good marzipan! Walnuts and hazelnuts can also be used with great success. Pistachios makes it somewhat green and is very delicious. It is often used for making an exquisite ice cream. Marzipan on other nuts taste differently of course, but that is the whole point, right? I know of some Danish confectionery manufacturers who sell it. I dont know if it would technically be called "marzipan", if it is made on other nuts than almonds? Hello.. thank-you for this wonderfully rich tasting marzipan recipe,, can lily white corn syrup be used instead of the home-made syrup? I can not buy bitter almonds where I live but I CAN buy bitter almond pure extract can this be used instead ??? Hi. The weight in g will always be the most accurate. When I round up or down I round it in a way that makes sense in my experience. I don't make it with the cup equivalent measurements. That being said. 1 dl sugar weigh 100 g. (I have tested this.) And a cup is 2½ dl. So 1 cup of sugar should weigh 250 g. This depends on the grain sizes of the sugar naturally. Icing sugar is lighter than "normal" sugar. Thanks for the prompt answer! I also rather do the formulas by weight so I guess I will go with the 225gr then. Just FYI if you want to give it a try, 1c of granulated sugar weights 200gr or 8oz. if you are using icing or powder sugar then 1c. is 120gr or 4oz. That goes if you are using standard dry measurements cups, if you are using liquid measurement cups then your weight will vary. Those are internationally used numbers for cooking and or baking. Cheers from Argentina! Now your recipe makes totally sense if talking in % because 300gr of almonds will be a little over 2c and 225gr a little bit bore than 1c of granulated sugar so it has 100% almonds with 50% sugar content. My last question is… In the video the syrup you added to the ground almonds seems very dense, almost like glucose or corn syrup so that means when I cook the syrup I have to let it reduce a lot? Do you know the temperature it has to reach before cooling down? Thx again! Have you ever used bitter almond oil, rather than the bitter almond? I can purchase bitter almonds for $40 +$15 for shipping, for a pound. I suppose, I could freeze them. What is your views and experience? Hello, You mentioned it keeps for three weeks in the fridge. Is it better to refrigerate it than to keep at room temperature? Thank you. As long as it is tightly wrapped it does not make much difference. 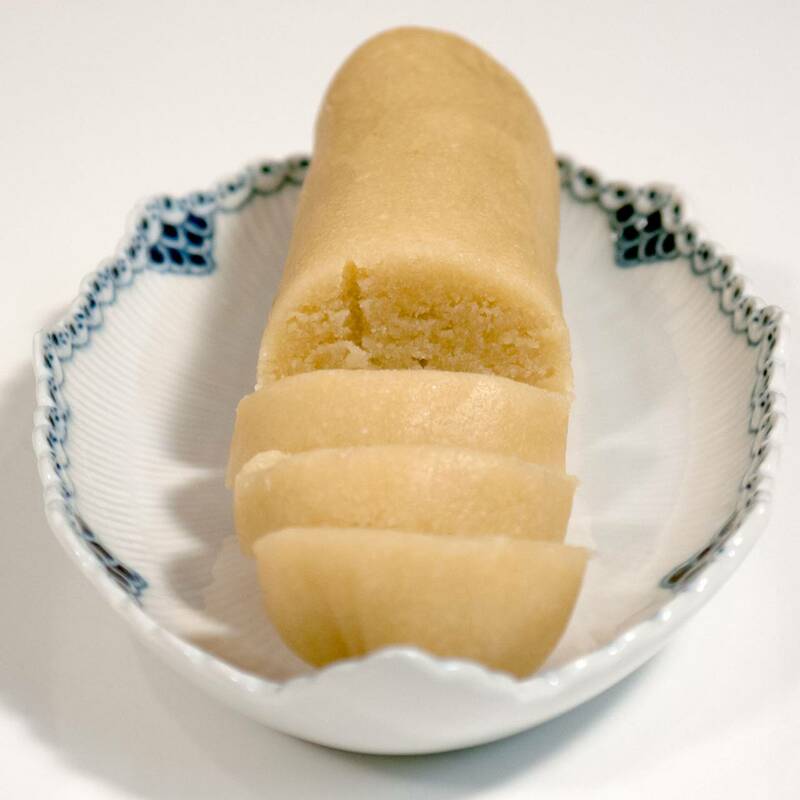 marcipan keeps very well due to the high fat content. If it is the hot time of the year it has a tendency to dry out a bit though. My German grandmother added rose water to the marzipan. That may be your missing "something". It doesnt take much rose water; for this amount of marzipan use 1/2 tsp.